Astronaut photograph ISS038-E-47389 was acquired on February 14, 2014, with a Nikon D3 digital camera using an 80 millimeter lens, and is provided by the ISS Crew Earth Observations Facility and the Earth Science and Remote Sensing Unit, Johnson Space Center. The image was taken by the Expedition 38 crew. It has been cropped and enhanced to improve contrast, and lens artifacts have been removed. The International Space Station Program supports the laboratory as part of the ISS National Lab to help astronauts take pictures of Earth that will be of the greatest value to scientists and the public, and to make those images freely available on the Internet. Additional images taken by astronauts and cosmonauts can be viewed at the NASA/JSC Gateway to Astronaut Photography of Earth. Caption by M. Justin Wilkinson, Jacobs at NASA-JSC. This panoramic image from the International Space Station (ISS) captures Tierra del Fuego and Cape Horn, the southernmost tip of South America. The Atlantic Ocean is in the foreground and the Pacific Ocean spreads across the top of the image. 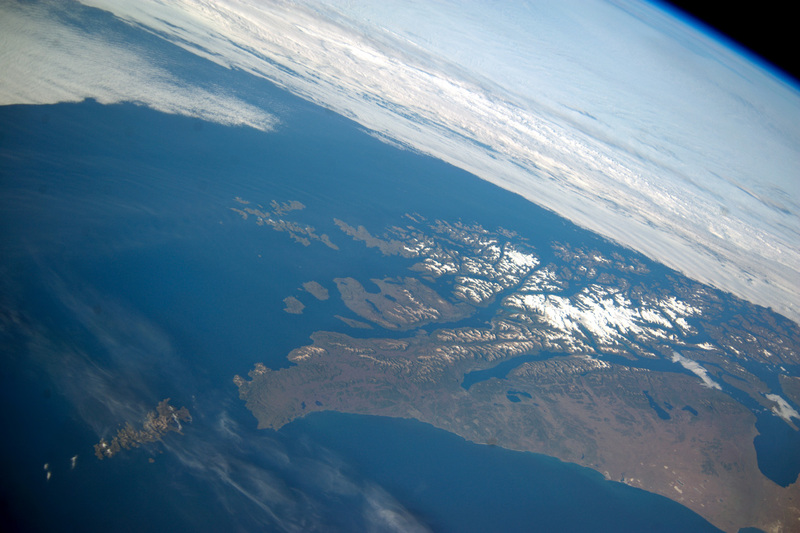 Crews on the ISS seldom see Cape Horn in such clear weather. Shortly after this image was taken, the cloud mass approaching from the Pacific Ocean completely obscured the landscape from view. In this stormy part of the world, ships avoid the heavy seas around Cape Horn and use the protected Strait of Magellan on the inshore end of Tierra del Fuego. A small, white ice field on the highest parts of Tierra del Fuego includes Mount Darwin, situated within Chile’s Agostini National Park. The ice field was much larger during the geologically recent ice ages, covering an area greater than the land shown in this view. The heavily indented shape of the fjord coastline and the lake depressions (image center and lower right) were carved by the downhill movement of these now-vanished glaciers.